Q: What was the muzzle thread used for? A: It was used to attach the blank firing device. It is normally found on m/1938 and rarely on m/1896. It is never found on the sniper-version m/1941 or the carbine m/1894. Q: I have seen a bag on the side on pictures? A: The bag was used only for peace time exercises to collect spent brass after firing of blanks. The disks are positioned upside down on the right side of the stock, because when the soldier who normally is a right-handed shooter, looks at the disk he will have the disk in the right position. The largest sector is stamped with the calibre of the barrel. The m/41 round had a much flatter trajectory than the older m/94. 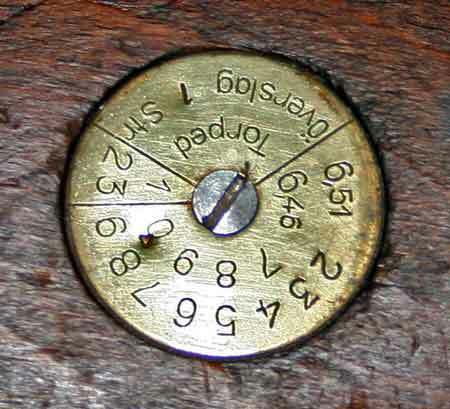 As most rifles were already manufactured with iron sights for the "m/94 bullet", the aiming correction in mills (how much lower you had to aim to hit the target) was inscribed on the brass disc. This is the information in the second sector. It was usually 0,5 mill. The last sector gives information on the level of bore pitting. 1 means pitting in the groves. 2 means pitting in the groves and on the side of the lands. 3 means pitting in the whole bore (= unserviceable). A rifle would never receive a 3, it would instead be turned in to a work shop, where the old barrel would be exchanged for a new one. Used on the m/94 carbine, the m/96 and m/38 rifles as well as on LMGs and SMGs. This type showed which unit the rifle belonged to. at the 2nd Infantry Regiment. Sometimes there is a letter behind the regiment. in the name of the place for the detachment. attached to the 19th Infantry Regiment. "Landstormen" was the name for the Swedish Teritorial Army. (velocipedordonans), at the 3rd Army Division (armefördelning). There was one exception from this kind of 'unit'-disk. 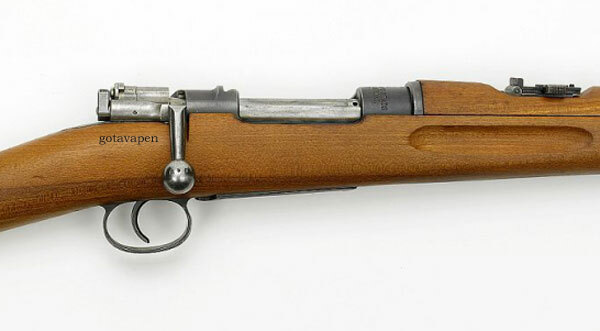 Which reads "Gevär m/41 B" ('Rifle model 41B'). It seems like the Coast Artillery also used the KA1 - KA5 denotations. Was there a special sniper rifle version of the m/96? 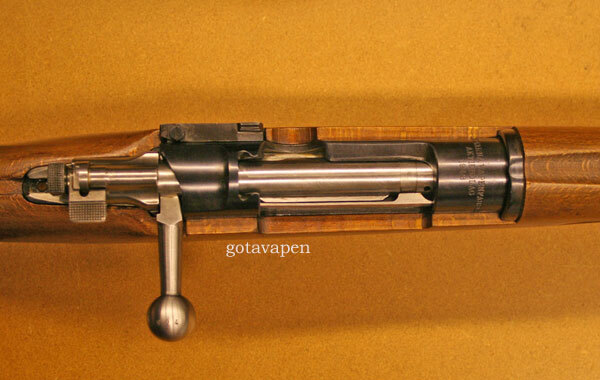 Yes, there was a special sniper rifle version of the m/96 designated rifle m/41 ("Gevär m/41"). These rifles were selected species of "well shooting" m/96’s. Prior to the modifications their bores were checked and the rifles were fired for accuracy. The modifications consisted of drilling and tapping the receiver on the left side of the receiver and to mount a telescopic sight with mount. These sniper rifles are now obsolete, and were replaced in 1991 with the modern 7,62 mm sniper rifle PSG 90. 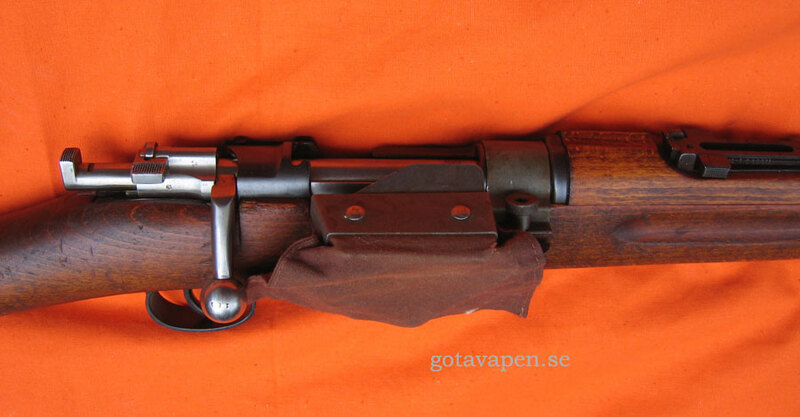 Translated - "Gevär m/41 B" ('Rifle model 41B'). What does the "turn down bolt handle" indicate? A "turn down bolt handle" on m/1938 rifles indicates that the rifle is a converted m/1896. All m/96 had straight bolt handles. 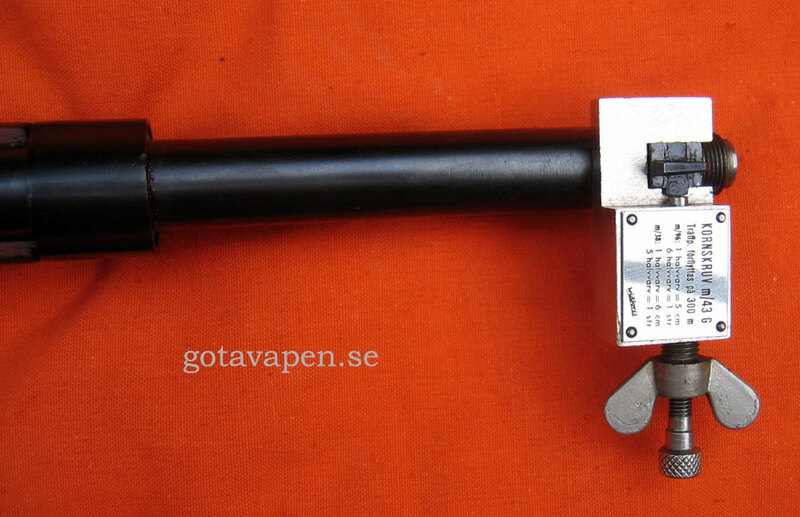 Husqvarna made m/1938 were normally produced as m/38 with the handle down from the beginning (like the picture above). 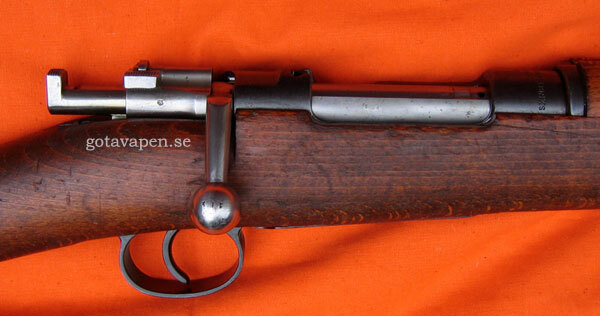 However there is a small number of HVA produced m/1896 (with straight handles). Q: Why is there a lug on the cooking piece? The soldiers were allowed to dry fire the rifles in training if they first put a piece of leather between the cooking piece and the bolt. That was the reason for the lug on the cooking piece. 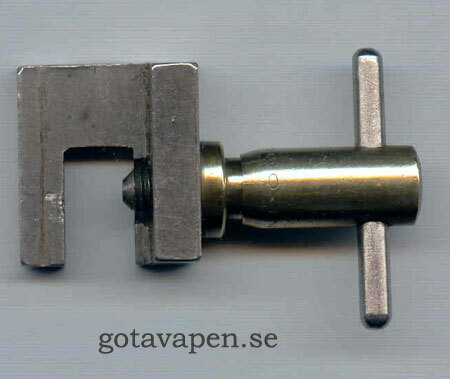 On the picture the mechanism is cocked and locked. Safe to the same side as the handle! The reason for the checkering of the cooking piece is to make it easier to dismantle the bolt. Q: What accessories were used? 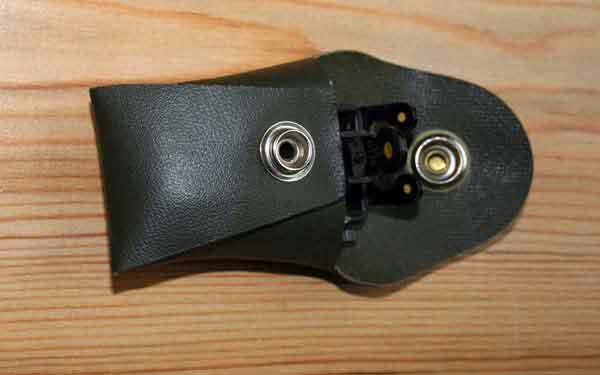 Different front sight adjustment vises were used. 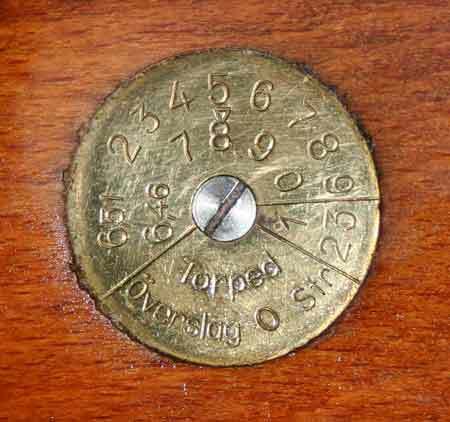 On top m/43G marked with instructions for adjusting the sight of the m/96 and m/38. To the left another type of adjustment vise. Q: Why is the cleaning rod so short? There was an attachment that should have been used, but it was never issued for the field service - only for peace time cleaning in the barracks. It looked like this. 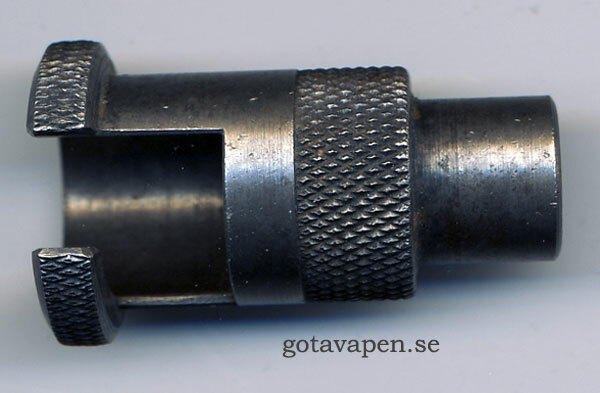 This Muzzle protection was normally used together with the cleaning rod. Q: What was the purpose of the hole in the front barrel band? It was used during rests when the soldiers connected their rifles together with a cleaning rod through this hole. Bolt handles on Kar m/94, Rifle m/96 and m/38. m/1896, m/1938, m/1941 and Carbine m/1894.